Our tour guide and driver will pick you up at your hotel. Begin your new trip with the city center. In the heart of Ho Chi Minh City, visit Reunification Palace (outside) – Notre-Dame Cathedral – Center Post Office – Opera House (ouside) – City Hall (ouside). 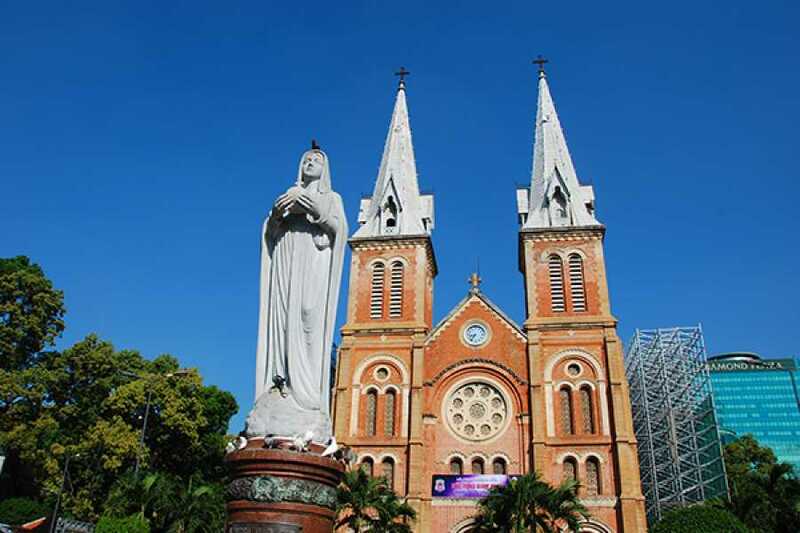 Ho Chi Minh City afternoon tour: The tour is back to Old Saigon with the tour to Cholon area also known as China Town, where you can find they sell everything in the huge area surrounding with the most competitive price as wholesaler and Oriental Medicine Street. Next, visit Lady Thien Hau Pagoda, typical Chinese pagoda in China Town, Ho Thi Ky flower market. Then finishing with Ben Thanh Market – one of the most famous market in Ho Chi Minh City. 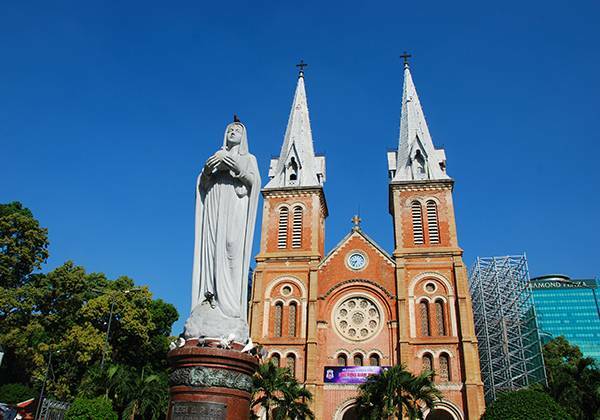 Exploring Nguyen Hue Walking street and Mong Eiffel bridge with the overlooking of Saigon river and city center. Transfer to your hotel around 18h. Overnight in Ho Chi Minh City. *This program can be changed due to your flight. After breakfast at your hotel, our guide and driver will pick you up for the tour back to visit old battlefield in south of Vietnam. Cu Chi Tunnel tour is famous because you can experience yourself in the area of old real battlefield, you will have chance to explore a part of 200 kilometer network of underground tunnels, with was used by the Viet Cong to fight against both French and Americans war. Now, Cu Chi Tunnel is open widely for tourist to come and enjoy the atmosphere of its jungle. During your trip, do not forget to have yourself memory photos of tank or other memorabilia of the war still carefully remain in Cu Chi Tunnel. After the tour, we will enjoy a taste from this area, it is boiled cassava, the people in Vietnam often used it during war period. Moreover, if you are a person who would like to have thrilling, you can join to shooting range in Cu Chi Tunnel. Heading to Mekong delta, after 2.5 hours of driving from Cu Chi Tunnel, we will explore the delta of rice, fruit and fish where biggest and widest of Vietnam. After a drive around two and a half hour, we will change the mean of transportation to the boat, to visit the delta by waterway. We will have chance to see the people living along the river which has very basic living condition. In this area, mostly people living in the water or in the orchard which full of healthy and delicious fruit, if you like photograph, it is a chance for you to have the portrait of children living in the river, or people who working in the boat to sell the agriculture product. It is such an impression image of mekong delta. After short time traveling by boat, we will arrive small island in the area where we will enjoy the atmosphere of orchard of local people where we can meet and enjoy fresh fruit during watching live traditional performance of music. This traditional music recently was received the UNESCO certificate honouring Vietnam’s DON CA TAI TU as an Intangible Cultural Heritage of Humankind. It is such a imperfective if we travel to mekong delta without taking a small sampan to visit the small channel where surrounded by palm tree, the truly natural and quiet place you have never feel before. You can just hear the noise caused by the rowing and smile of people living here. It is your free time really to enjoy yourself the mekong delta living, you can rent a bicycle to explore the living here, go fishing or just relax on the hammock to take a nap surrounding countryside before back to Ho Chi Minh in the afternoon. Overnight at the hotel in Ho Chi Minh City. After having breakfast, free at the hotel. Our driver will take you to the airport for your return. End of service.